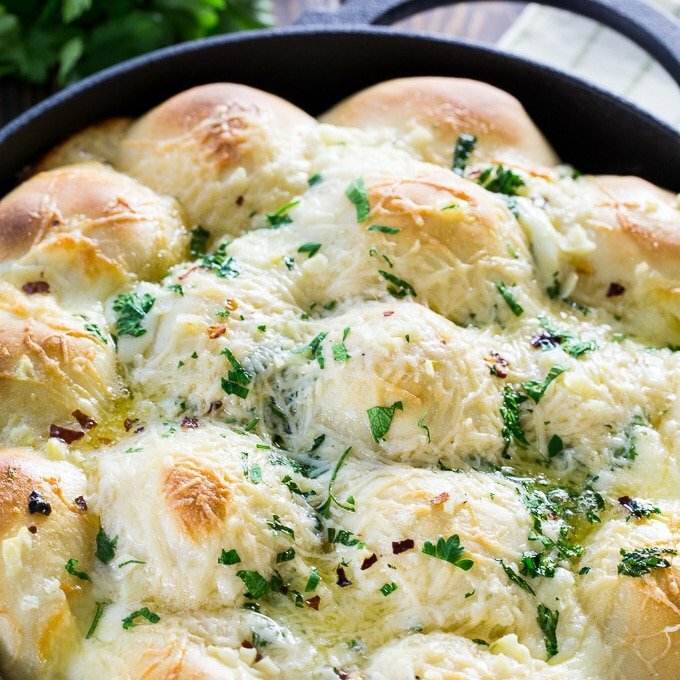 Cheesy Garlic Skillet Rolls are stuffed with mozzarella cheese and coated in butter, Parmesan cheese, and garlic plus a few crushed red pepper flakes and parsley. Rolls don’t get any better than these! So much buttery, garlicky, cheesy goodness! To start with, I use frozen yeast rolls. Any brand of frozen dinner roll dough will do, but you want to use the ones that come loose in a bag. Not the ones in a foil tray. Rhodes is a good brand and I used Bridgford for these. You either need to let them thaw on the counter which will take about 4 hours, or better yet, just stick them in the fridge the night before and they’ll be ready the next day. These rolls are super easy to stuff with mozzarella using mozzarella sticks. Cut each stick in 4 pieces and wrap a piece of dough around each one, sealing them the best you can and placing them seam side down in a 12-inch cast iron pan. 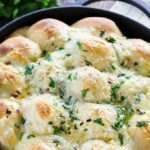 Cast iron is best for these Cheesy Garlic Skillet Rolls becasue it retains heat so well, but you could use a 9×13-inch baking dish instead. Once the rolls are stuffed and shaped, they need to rise about 60 to 90 minutes. More mozzarella cheese gets tucked between the rolls and they are baked for 10 minutes. Next they are liberally coated with melted butter, garlic, garlic salt, red pepper flakes, plus Parmesan cheese and parsley. Then they are popped back into the oven until golden on top. 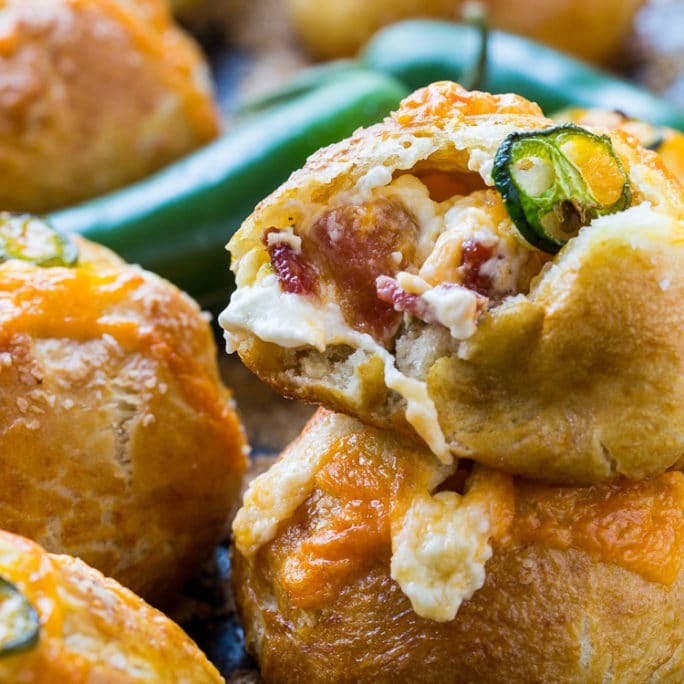 These rolls are so fabulously delicious, it won’t even matter what you serve them with. 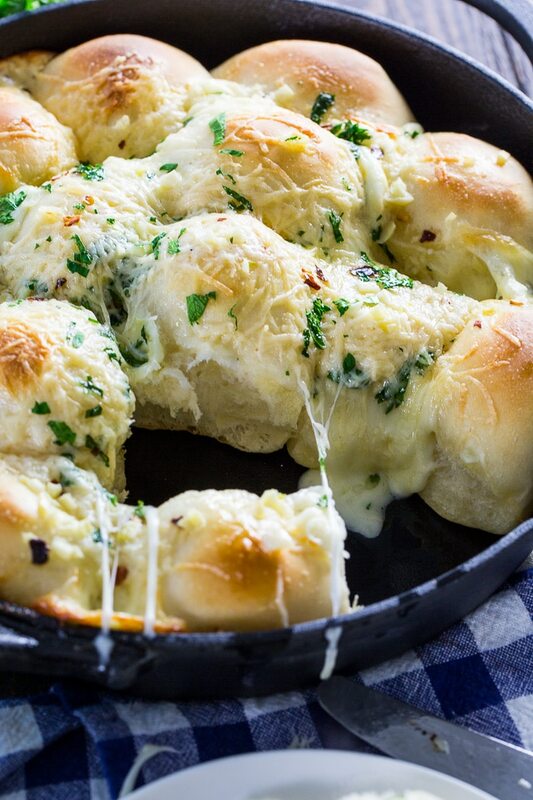 All attention will be on these Cheesy Garlic Skillet Rolls! 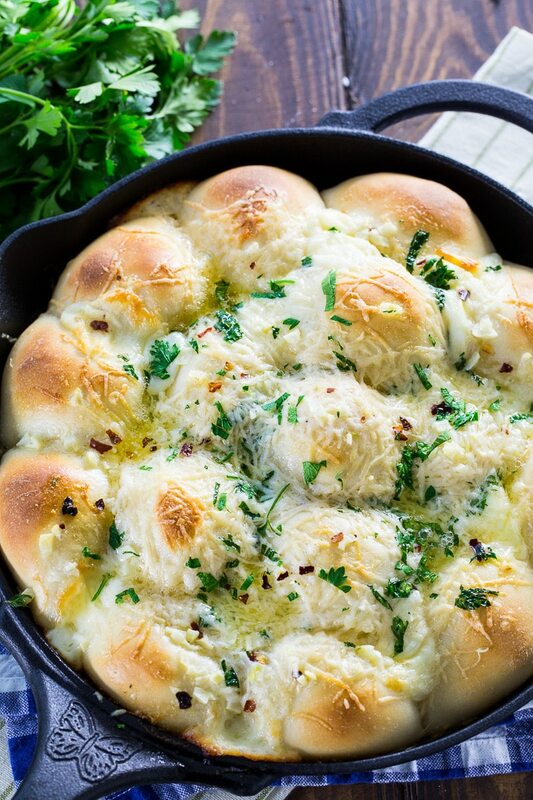 Cheesy Garlic Skillet Rolls are stuffed with mozzarella cheese and coated in butter, Parmesan cheese, and garlic plus a few crushed red pepper flakes and parsley. Rolls don't get any better than these! So much buttery, garlicky, cheesy goodness! Thaw frozen dinner rolls overnight in the refrigerator. You will only need 16 of them. Cut 4 of the mozzarella sticks into 4 equal pieces each so that you have 16 pieces. 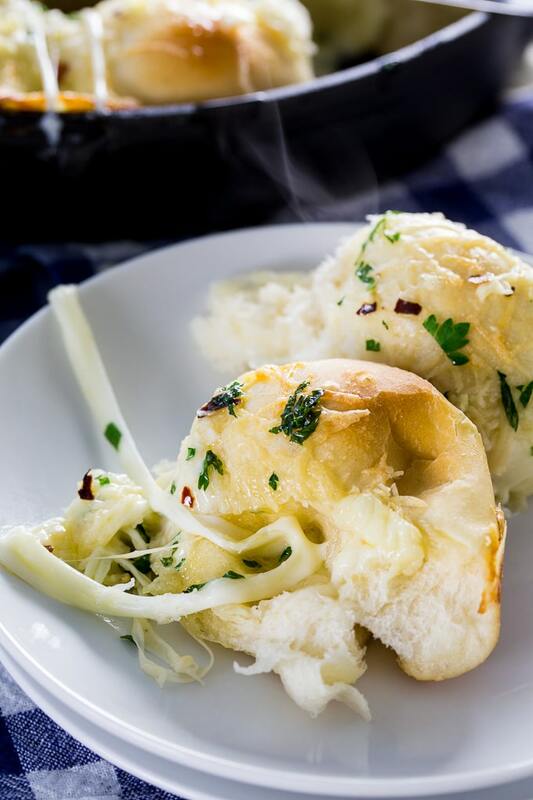 Fold each defrosted dinner roll around a piece of mozzarella, pinching the edges to seal. Place seam side down in a greased 12-inch cast iron pan. Cover with a kitchen towel and let rise in a warm place until doubled, about 60 to 90 minutes. Cut the remaining 2 pieces mozzarella cheese into 8 pieces each. Once rolls have risen, tuck these pieces between the rolls. Preheat oven to 375 degrees. Bake 10 minutes. While they are baking, place butter, garlic, garlic salt, and red pepper flakes in a small microwave safe bowl. Microwave until butter is melted. Once rolls have baked for 10 minutes, remove them from the oven. Sprinkle with Parmesan cheese and parsley. Drizzle butter mixture on top. Return to oven and bake 5 to 8 minutes, or until golden brown on top. This entry was posted in Breads and Muffins and tagged cheese, rolls. Bookmark the permalink.